The Transition from the Co-Digital to the Post-Digital. The Post-Digital was seen as a negative principle which devalues engagement with the technical encouraging us to be unthinking consumers of new hardware and platforms as they become ever more culturally ‘transparent’. The Co-Digital then describes the period of ‘flux’ (this is a term from the ‘Digital Habitats’ by Etienne Wenger, Nancy White, and John D. Smith) which a technology goes through as the user community appropriates it and influences its development. This period is early in a technologies life-cycle but may not be in effect for very long as the user community expands. Instead of the Co-Digital replacing the Post-Digital I think that they are concepts which describe different points of a larger process of transition. 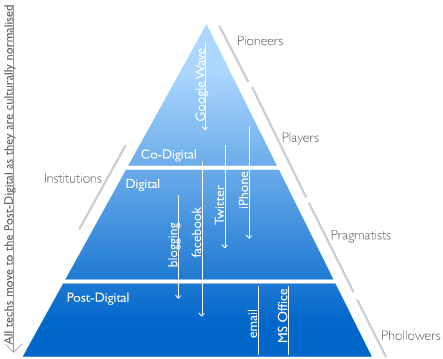 I have tried to describe the transition technologies make from the Co to the Post-Digital in the diagram below. The model is an attempt to bring together the thinking that has emerged from the Post-Digital idea and put it in a larger context. Technological transition from the Co-Digital to the Post-Digital. The point at which the socio-tech flux (Wenger uses the term ‘Vortex’) is most fluid. Social appropriation of the tech influences its development. Similarly the tech starts to form the manner in which social engagement takes place and in which social capital is built. The tech is seen a culturally ‘shiny’ but its role is beginning to become ‘fixed’ in the mind of its growing community and in its socio-tech function. The tech is no longer ‘shiny’. It is culturally normalised and not conceived of as ‘technology’ (‘Disappearing into Use’ is an brilliant phrase I have hear which describes this). The tech is now understood by its core function i.e. culturally, the phone is seen as the conversations you have when using it. It is not generally considered in technological terms anymore. This phenomenon could also be seen as a transition to the Post –Technical. They build new stuff because they think it’s cool. Likely to be very tech orientated. Pushing the boundaries of what is possible technologically. Probably community leaders. Not as tech focused as the Pioneers but they are adept at appropriating the new tech to their own ends. This is often done by building networks/community or promoting themselves as a brand. They are happy to subvert functionality and influence the evolution of the tech. They follow players into technologies. They want to know what a tech is ‘for’ and how to use it ‘correctly’ before joining. They enjoy the ‘shiny’ once there is a cultural consensus. i.e. They are buying iPhones from Tesco’s now. They also actually like ‘top ten’ style lists on how to use platforms properly. They use the tech once it is fully culturally normalised. They are not interested in experimenting. This group bought the mobile phones they claimed they didn’t need once all their friends had one. When these guys get involved they accelerate the shift from the Co Digital to the Digital. Think Twitter and the BBC. We need to influence the evolution of technology while it’s in the Co-Digital space. i.e. Edtech folk need to be players (well, some of them at least). Once a tech has moved out of the Co-Digital it is difficult to influence although it may be re-appropriated later in a different context. In my opinion Twitter is currently moving out of the Co-Digital space. As the user base in a tech expands the Pragmatists begin to out number the Players. Because the Pragmatists have a relatively fixed idea about the function of the tech this means that it becomes increasingly difficult for the tech to stay in flux. Think of the backlash every time facebook attempts to make changes to its interface or functionality. Once tech hits the Post Digital it is pretty much game over for direct innovation (but as I have mentioned re-appropriation is possible). Once Google and the ‘cloud’ become Post-Digital they will actually be running the world. “These two facets of social learning over technology – innofusion and domestication – are not separate. However these concepts were coined separately and for differing purposes. They draw attention to differing aspects of the innovation process – respectively, the evolution and biography of artefacts (Pollock et al 2003) and the evolution and biography of user (and user organisation) practices/culture. I agree that the relationship between tech and social/organisational practices is complex (more complex than the model can currently describe). I think I’m trying to say that the nature and the speed of those changes you mention slow down at tech moves to the Post-Digital. Part of the problem is that the evolution of artifacts and the evolution of the user are becoming increasingly interlinked. This is tricky stuff to pick apart in any meaningful way. Thanks for this post, Dave. It does strike me, though, that the model you have is one-way: it implies that Google Wave will eventuually reach the post-digital holy grail which email and MS Office have achieved. But is this really the case for email and MS Office? Aren’t we in an environment in which email usage is declining and MS Office is being threatened by office applications in the Cloud? Shouldn’t there be a plug-hole (or waste pipe) in the pyramid? Yes Dave, I find it very difficult. So for one technology’s trajectory at any one time it will have a different mix of the 4 P users. It would be interesting to think about the nature of the impact of each P on the tech’s development. ALso interested in the types of users within institutions. Once a tech becomes Post-Digital it is vulnerable to becoming obsolete both culturally (from a fashion point of view) and functionally as it can no longer be updated but needs to be reborn. @Frances In terms of take-up and initial engagement the Players are absolutely crucial. Google uses the frighteningly manipulative ‘invites’ system to get Players involved in a form of social capital pyramid sale. It’s the point at which the amount of Pragmatists comes close to the number of Players that a shift really starts to take place. I think institutional take-up happens at around this point as institutional approaches are always pragmatic (if we are talking about center-out initiatives). Of course institutions contain a lot of Players but these users act as individuals in their engagement with new tech and are likely to have a personal ‘brand’ which overshadows their institutional affiliation. But shouldn’t ‘post-digital’ be a holy grail? For many the phone, the car and other domestic ‘technologies’ are no longer seen as technologies, and are regarded as successful because they ‘just work’. It is interesting to read that Google intends that its Google Chrome OS as providing a ‘platform that just works’, by providing centralised control. Isn’t this something that society would, in many respects, welcome whilst technologists, such as you and I, would be concerned with? But are our concerns (over Google control, for example) simply us protecting our own interests? @Brian Of course the concept ‘just works’ actually means ‘everyone has worked out how to use it’ or ‘everyone can see a need to use it’. Perhaps we are just one side of a tension that should exist between the corporates who sell us ‘platforms that just work’ and the ‘Players’ (one of my 4P groups) who have their own agenda and attempt to appropriate what ‘Just Works’ means in a social context. My overall point being that once it gets to ‘Just Works’ the Players will have a tough time changing what that tech ‘means’. A thought provoking post. I agree that ‘disappearing into use’ is great phrase for describing the shift in focus from technology to task and function. I wonder if the diagram could be enhanced by indicating convergence of individual technologies into task and function clusters in the post-digital stage? I also wonder if the increasing use of mobile personal technologies provides an additional dimension to the post-digital stage where virtual tasks and functions are further embedded / integrated in the physical world through location independence? The specific technologies represented can of course only be examples in the diagram, but I wonder if location based technologies are an important cluster. These can be considered to have migrated through the 3 stages to post-digital use as in-car navigation systems. However these functions are now being increasingly integrated into ‘generic’ personal technologies (possibly resulting in a horizontal move in the schematic) adding a further element to the interface between the physical and the virtual, e.g. location aware social networking. Finally the comment on the Pragmatists fixed ideas on a technology’s function is also interesting in the context of the potential migration of a technology’s use from one domain to another, informal use to formal use etc. The physical context of a technology has a large effect on how quickly it might move to the Post-Digital. As the hardware we use to connect to the network moves from the office/study to the living room/car/pocket the nature of our engagement also changes. More of our technological engagement will have a social context(?) which I suspect will accelerate a techs move through the Co-Digital space. As for clustering, I can see how that is a useful principle but I get nervous when a diagram get’s too complex. I’ll have to have a good think about what the horizontal dimension could represent. Is there a specific reason to not use the classic “diffusion of innovation” phases here? It basically seems like “pioneers, players, pragmatists…” map pretty much to “innovators, early adopters, early majority…” Is there something inherent in Roger’s notion of “adoption of technology” you are resisting by inserting your own terminology? Plus that would address Brian’s concern that not all techs become culturally normalized, e.g. not all ‘cross the chasm.’ Sorry if I am not getting this, it’s just that is the language I have heard applied very often to seemingly this same progression. @Scott Thinking in detail about how this relates to Roger’s work is something I do need to get on with. My main interest is how social media influences this cycle because I think ‘users’ maybe have more power to influence and appropriate the tech while it’s in the Co-Digital space. Pingback: TALL blog » Blog Archive » Initial reflections on the future of online learning.